• Nearest subway: Spring Street. Little Italy is situated in the lower Manhattan area of New York and comprises a few blocks of Canal and Mulberry Street. The neighbourhood takes its name from the large Italian community that once lived here. Although many of New York’s Italian residents now live in other parts of the city, Little Italy has managed to retain its quirky and enchanting Italian atmosphere. The Italian American Museum is a great place to learn all about the emergence of the Italian community in New York. The museum features and number of excellent displays, which show how life would have been for the Italian immigrants when they originally settled in the Big Apple. The museum also hosts regular exhibitions dedicated to Italian art, history and culture. Old St. Patrick’s Church is situated between Prince and Mott Streets and dates back to the start of the 19th century. This was the first cathedral church to be built in New York City and is a popular attraction with lovers of architecture. Little Italy features charming cobbled streets and tenements that date back to the turn of the century. As visitors wander through this district that are met by the smells of Italian food and surrounded by other aspects of Italian culture. It is a well-documented fact that few of the residents in Little Italy these days are of Italian origin. Many of the people who live in this district are business owners. Famous residents include entrepreneur Mort Berkowitz. 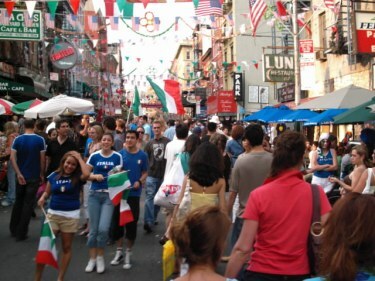 Dining is a popular activity among visitors to Little Italy. 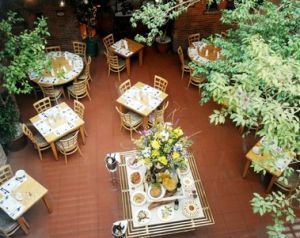 This is a fantastic place to dine on authentic Italian cuisine. Many visitors to Little Italy time their trip to coincide with the vibrant feast of Feast of San Gennaro. This vibrant festival is held to honour the patron saint of Naples and features carnival rides, floats, music and plenty of food. Little Italy is also a great place to explore in the evening. Visitors and residents alike travel to Little Italy to start the evening with a hearty Italian meal before moving on to one of the local bars. Little Italy is the perfect place to dine on authentic Italian pizza and gourmet Italian dishes. The restaurants here come in all shapes and sizes, from small family run establishments to large gourmet restaurants. These eateries attract both residents of New York and tourists alike, and many people can be seen conducting business meetings over bowls of pasta. Some of the most popular establishments in Little Italy among lovers of Italian food include Grotto Azzurra, Il Cortile, Il Pallazo and Il Fornaio. Little Italy boasts a vibrant nightlife scene, and there are several interesting bars to be found here. The Mulberry Project is a great place to sit and sip a cocktail or two, while the Mulberry Street Bar has been receiving revellers for more than a century. Other popular places to enjoy a drink in Little Italy include Florio’s Grill & Cigar Bar and Capitale. Little Italy is generally a safe neighbourhood to explore, although visitors should take extra care after dark. The high volume of traffic in this part of the city can make crossing the roads tricky, especially for first time visitors to Manhattan. What to avoid in Little Italy? When searching for leather goods it is best to purchase them from reputable merchants rather than the stalls the line the sides of the main streets. If purchasing items from street vendors, check the quality of the items carefully. Many New Yorkers avoid the touristy centre of Little Italy and head straight to the NoLita area, which can be found to the north just off Houston Street. This is the best place to find authentic Italian food and other treats. Chinatown is situated within easy walking distance of Little Italy, and this is also a good place to spend a little time while exploring this vibrant area of New York. What’s nearby? Visit Chinatown and Nolita (North of Little Italy) while you’re in Little Italy, since it’s only 5-10 minutes walk away. If you are prepared to travel by metro (subway), try Brooklyn.